RULE KIM It was June 18 when we got the bad news, we went everywhere to find a cure. Family and Friends are warmly invited to attend the Funeral Service to celebrate the life of the late Kim Lindsay Rule of Joondanna to be held in our Seasons Chapel, 401 Wanneroo Road, Balcatta on FRIDAY (29.03.2019) commencing at 2pm. 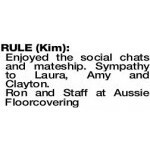 RULE KIM Enjoyed the social chats and mateship. Sympathy to Laura, Amy and Clayton. RULE KIM Kim was a very popular past player and committee member of our club. Our deepest sympathy to his family. Moira and I extend our deepest sympathy to Kim's family. Kim was a great friend and colleague who dedicated his adult life to the fuel injection industry. 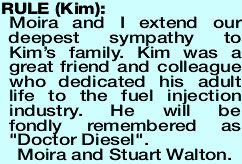 He will be fondly remembered as "Doctor Diesel".